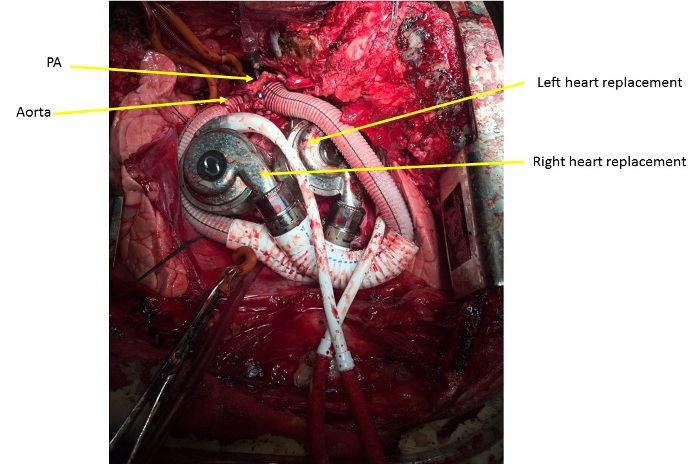 Here, we present a protocol using two centrifugal pumps as a total artificial heart replacement. Bishawi, M., Roan, J. N., Richards, J., Brown, Z., Blue, L., Daneshmand, M. A., Schroder, J. N., Bowles, D. E., Milano, C. A. Use of Two Intracorporeal Ventricular Assist Devices As a Total Artificial Heart. J. Vis. Exp. (135), e55961, doi:10.3791/55961 (2018). Mechanical circulatory support (MCS) has been introduced as a viable alternative to heart transplantation primarily through the use of intracorporeal ventricular assist devices (VADs) for support of the left ventricle. However, certain clinical scenarios warrant biventricular mechanical support. One strategy for some patients is the excision of both ventricles and the implantation of two VAD pumps as a total artificial heart (TAH). This has recently been made possible by the improvements in device design and the small profile of centrifugal devices. This TAH approach remains experimental with many important challenges such as the device settings to balance the right and left circulation, the orientation of the devices and the outflow graft with their influence on hemolysis and stability, and the outcome of chronic support using such an orientation. This protocol aims to provide a reproducible approach for total artificial heart replacement with two intracorporeal centrifugal VADs in a cow model. There has been growth in the number of patients with heart failure, with an estimated 5.7 million adults suffering from this condition in the United States today1. Around 300,000 patients have end stage heart failure with a life expectancy of less than one year. While heart transplantation remains the gold standard therapy for end stage heart failure, it is greatly limited by the number of available donor organs. MCS has been introduced as a viable alternative to heart transplantation especially through the use of VADs2. VADs work by unloading the left ventricle and providing forward flow (supported by a pump) directly into the arterial circulation. VADs may be implanted as a bridge to transplantation as well as a destination therapy for patients that do not qualify for a transplantation3. Since their FDA approval less than a decade ago, the annual number of VADs implanted has surpassed heart transplant numbers, with this number exponentially increasing4. However, in a subset of patients, heart failure is biventricular (i.e. affecting both the left and right ventricle) and simply supporting the left ventricle alone may not provide adequate perfusion. In these situations, the right ventricle requires temporary mechanical support5. This type of "RVAD" requires the use of large cannulas connected to an extracorporeal pump that restricts the patient to the Intensive Care Unit (ICU) while the ventricle recovers. For a limited subset of patients, another option is a TAH6,7. The indications for TAH usage are: a biventricular failure after post infarct, a ventricle septal defect (VSD), a severe restrictive myopathy which precludes ventricular cannulation, and a failed heart transplant requiring chronic support. However, the currently FDA approved TAH device is large and cannot be used in smaller patients. In addition, the pneumatic drivers are sizable and limit the mobility of the patient. One experimental strategy for some patients is the use of a second VAD to support the right ventricle8,9,10. In this scenario, both ventricles are excised, and two VADs are implanted as a TAH. This has been made possible by the improvements in device design and the shrinking of the device profile. New centrifugal VADs are much smaller, allowing for two VADs to be implanted next to each other to support both the left and right circulation. This approach remains experimental with many important challenges including the device settings to balance the right and left circulation, the orientation of the devices and outflow graft with their influence on hemolysis and other adverse events. The purpose of this protocol is to provide a reproducible approach to TAH replacement with two centrifugal VADs in a cow model. Age-matched (for blood donation if needed) calves (weight 80–90 kg) are cared for in the animal facility. Housing and all treatment procedures are performed in accordance with the guidelines of the Animal Care and Use Committee of Duke University Medical Center. After fasting for 8–12 h, pre-medicate the calf with Telazol (4.5 mg/kg/intramuscularly) and then administer isoflurane (1–4%) via a face mask. Place the cow in a supine position on a heated table and intubate. Fix the extremities to the table using heavy ties. Place an intravenous catheter (14–20 gauge) in the ear vein. Administer diazepam (0.22–0.44 mg/kg/intravenously) if chewing and swallowing are highly prevalent, or if the animal is biting on the endotracheal tube (ET) tube. Additionally, administer if there is difficulty with intubation to help facilitate airway exposure for intubation. Start mechanical ventilation at a tidal volume of 10–15 mL/kg and a rate of 20–25 bpm, with isoflurane (0.5–4%) maintained throughout the procedure. Secure the ET tube using ties to ensure no changes in tube position during the operation. Continuously monitor the oxygen saturation and heart rates throughout the experiment. Address any difficulties with ventilation or oxygen saturation (SaO2) immediately. These will likely be related to either tube position, or ventilator settings. If it is tube position, adjust the ET tube to achieve adequate tidal volumes. Although the following may be done percutaneously using ultrasound guidance, use a cut down approach to better control any local bleeding once the animal is anticoagulated. Using the trachea as a landmark, shave the neck fur (with hair clippers), and sterilize the area using betadine. Make a parallel linear incision 1–2 cm away from the trachea and 20 cm from the manubrium using a no.10 blade scalpel. Divide the sternocleidomastoid, and carefully expose the left common carotid artery and internal jugular vein using an electric cautery tool. Use a self-retaining retractor to help with the exposure. Maintain proximal and distal control of both the artery and the vein with large silk sutures (size 0 or 1 silk) or vessel loops. Cannulate the left common carotid artery with an 18-gauge catheter for blood pressure monitoring. De-air the line, and if bleeding is encountered, place a 6-0 or 7-0 polypropylene suture in a purse-string fashion around the catheter. Attach the pressure transducer to the console and transduce the pressure wave into the software under "systemic pressure". Read and record the output. Access the left internal jugular vein for both fluid and drug administration and central venous pressure monitoring. Attach the pressure transducer to the console and transduce the pressure wave into the software under "central venous pressure". Read and record the output. Secure both lines distally to the skin and monitor. Record baseline central venous pressure (CVP) and arterial blood pressure. Palpate the sternum from the manubrium to the xiphoid to choose a spot in the midline and mark using a sterile surgical marker. Shave the fur with a hair clipper, and sterilize the area using betadine. Apply a sterile surgical drape. Make an incision using a no.10 blade from the manubrium down to the xiphoid. Use an electric cautery tool to divide the pectoralis major down from the sternum, while being perfectly aligned to the midline using manual palpation of the lateral edges of the sternum. Score the midline of the sternum using the electric cautery tool. Begin the sternotomy from the bottom by dividing the xiphoid with heavy scissors. Extend the sternotomy cephalad with garden clippers. After each cut, inspect the sternum. Perform digital palpation underneath the sternum, and perform blunt dissection to help the heart and lung fall away from the sternum. Midway through the sternotomy some crossing transversalis muscle may be encountered and these are divided using electric cautery. Complete the sternotomy all the way to the manubrium. Take care to stay along the midline as this will be important for healing. After the sternotomy is completed, achieve hemostasis by scoring the bleeding muscle edges with the electric cautery tool. Apply bone wax to the marrow of the sternum to help with any residual bleeding. Identify the thymus and remove it using the electric cautery tool. Enter the pericardium in a longitudinal fashion, and reflect from the diaphragm up to the aorta. Create a pericardial cradle using five 2-0 silk sutures approximating the pericardium to the skin to pull the heart up and support it. Choose all the corners of the opened pericardium and bring them directly anterior to the skin using the silk sutures. Create a 3-inch-long window between the aorta and pulmonary artery by dissecting the connective tissue to allow for the passing of the aortic cross clamp. Apply a purse-string 4-0 polypropylene suture to the ascending aorta at a location proximal to the bifurcation. Circumferentially free the superior vena cava (SVC) using blunt dissection, and apply a second purse string 3-0 polypropylene suture. Establish systemic heparinization using an initial dose of 300 U/kg to achieve an activated clotting time (ACT) greater than 400 s.
Once the appropriate ACT is achieved, use a no.11 blade to enter the aorta, and insert an 18 Fr arterial cannula. De-air the cannula and attach to the arterial line of CPB. Next, place a 28 Fr SVC cannula in the SVC, and start a CPB. While on partial CPB, identify the inferior vena cava (IVC) and cannulate as described for the SVC. Do so while on bypass since it allows for better hemodynamic management given the need to push on the heart for the exposure. NOTE: There may still be a potential for the development of hypotension since CPB is only on as partial support at this point. If hypotension is experienced, this step should be done carefully and broken up to allow the animal's heart to fill intermittently. Once the IVC cannula is securely inserted, splice into the main circuit using a Y connector. Loop both the SVC and IVC with umbilical tape to allow for complete blood isolation from the heart. While on full cardiopulmonary support, snare down the SVC and IVC using the previously applied umbilical tape. Apply an aortic cross clamp proximal to the aortic cannulation site. Once the clamp position has been confirmed, start the ventriculectomy. Excise the ventricular tissue circumferentially 1-2 cm distal to the right and left atrioventricular groove. Leave the rim of ventricular muscle with the mitral and tricuspid annuli to provide further support for the implantation of the swing rings. Transect the sub-valvular apparati for the mitral and tricuspid valves as they are encountered. Excise the right ventricle outflow tract muscle with the right ventricular outflow tract (RVOT) including the excision of the pulmonary valve. Also, excise the left ventricular outflow tract (LVOT), but preserve the posterior aspect of the aortic valve as part of the aorto-mitral curtain. Divide the interventricular septum last. Identify the orifice of the coronary sinus and ligate with 5-0 polypropylene sutures. Use pledgeted, interrupted, 2-0 braided sutures to secure the sewing ring to the ventricular tissue and mitral valve annulus. Exit the sutures on the epicardial surface of the ventricular muscle rim and bring through the sewing ring. This technique avoids "bunching up" of the tissue above the ring which would interfere with the coaptation of the ring with the pump. Use a similar approach to attach the sewing ring to the right ventricle muscle rim and tricuspid annulus. Attach the CFPs to the sewing rings and secure with the standard locking mechanism. Orient these to allow access to the locking mechanism. Adjust the outflow graft length according to the orientation of choice. Once a proper length has been identified, cut the outflow graft. Take care to not make the graft too long as that may cause kinking. Use running 4-0 polypropylene sutures to anastomose the outflow grafts to the aorta (for the left heart CFP) and pulmonary artery (for the right heart CFP) in an end to end fashion. Prior to completing the anastomoses, release the tape on the SVC and IVC drainage cannulas and allow blood to fill the right and left pump, thus beginning the de-airing process. Place an 18-gauge needle into each of the outflow grafts for further de-airing. Use the ventilator to provide large volume breaths to allow for any air trapped in the pulmonary veins to be returned and de-aired. After de-airing is complete, remove the needle, and repair the site using pledgeted 5-0 polypropylene sutures. Start the pumps at a low rpm speed (3,000 rpm) to allow for forward blood flow, initially with the clamp still in place. Remove the aortic cross clamp and leave some blood volume to enter the pumps. Gradually increase the pump speed as the cardiopulmonary support is weaned. Terminate the CPB and support the circulation entirely by the right and left side pumps. Determine the final pump speed settings by the venous filling pressures on the right and left side. Introduce pressure catheters directly into the pulmonary artery and the pulmonary veins using a purse-string 5-0 polypropylene suture to secure them in place. Transduce pressure signals to the software under the labels "pulmonary artery" and "pulmonary vein". In addition, place ultrasonic flow probes around the ascending aorta and the main pulmonary artery. NOTE: All 4 channels should now be active: 1. "systemic pressure", 2. "central venous pressure", 3. "pulmonary artery" and 4. "pulmonary vein". While gradually decreasing the CPB flow, slowly increase the left CFP and then the right CFP speed while always maintaining a lower right CFP speed than the left CFP. Pay careful attention to the hemodynamics, including the systemic blood pressure and CVP. Pulmonary overcirculation is indicated by non-physiological pressures in the pulmonary artery or pulmonary vein. Eventually, increase the left CFP and right CFP speeds to achieve a flow of 4 L/min on each device and wean off the CPB. Once hemodynamic stability is achieved, remove the SVC and IVC cannulas and tie down the purse-string sutures. Next, remove the aortic cannula and tie down the purse-string suture. Euthanize the animal by slowly turning down, and then stopping both the CFP pumps while the animal is under anesthesia. Demonstrated in Figure 1 is the attachment of the sewing rings. Figure 1A shows the "bunching" of the ventricle tissue that may create a problem with pump attachment. Figure 1B represents the correct attachment. Figure 2 and Figure 3 are two different orientations of the pumps. In Figure 2, the pumps are positioned so that the outflow grafts are short and exit directly into the connected arteries. In Figure 3, the pumps are oriented so that the outflow grafts of both the right CFP and left CFP rotate around prior to being anastomosed to the pulmonary artery and aorta, respectively. It remains unanswered which orientation allows for less sheer stress on the blood, and has better overall hemodynamic profile for the pump. Furthermore, it is unclear which orientation allows for less kinking. Figure 1: Attachment of the sewing rings. Panel A demonstrates incorrect attachment of the right heart replacement sewing ring with the "bunched up" ventricular tissue. Panel B demonstrates the correct sewing ring incorporation into the ventricular tissue. Please click here to view a larger version of this figure. Figure 2: Direct outflow graft orientation demonstrating direct attachment of the right heart replacement to the pulmonary artery and the left heart replacement to the aorta. Please click here to view a larger version of this figure. Figure 3: A different orientation of the outflow grafts to the pulmonary artery and the aorta. Please click here to view a larger version of this figure. In this manuscript, we describe the use of two centrifugal flow VADs as an intracorporeal TAH. This technique maybe very useful to study the effect of artificial circulation on secondary organs such as the lungs and liver. Furthermore, it may be useful for the study of the hemodynamic changes from different pump orientations and flow scenarios. The critical steps within this protocol involve how the sewing rings are attached to the ventricular tissue while also incorporating the valvular annuli for strength. It is crucial to ensure that this is performed correctly as it will affect device stability. Furthermore, it is important to ensure that the outflow grafts are measured and cut at the appropriate length. Device instability and outflow graft obstruction represent important problems that may occur if these two steps are not carefully performed. The protocol describes two different methods of orienting the outflow grafts that may be important to avoid outflow graft obstruction. In the first orientation, the outflow grafts are connected directly to the respective great vessels in an orientation similar to the SynCardia Total Artificial Heart. In the second orientation, the grafts rotate around the other VAD as is commonly employed in clinical VAD cases. Using this experimental model, one can carefully study the hemodynamic scenarios associated with different combinations of pump speeds, to determine how to avoid the imbalance of left and right sided circulations. For instance, the direct measurements of aortic, pulmonary artery and pulmonary vein pressures allow for a real-time assessment of the overall hemodynamic status of the animal. This will be quite important for setting the correct speed parameters on the pumps to allow for balanced right and left circulations with: adequate arterial perfusion pressure; normal pulmonary pressures to avoid the possibility of pulmonary congestion; and normal central venous pressures to avoid renal or hepatic venous congestion. In the clinically available devices, "flow" is a calculated parameter which is not directly measured. In this protocol, we will directly measure flow in two locations for further precise assessment of the hemodynamics. 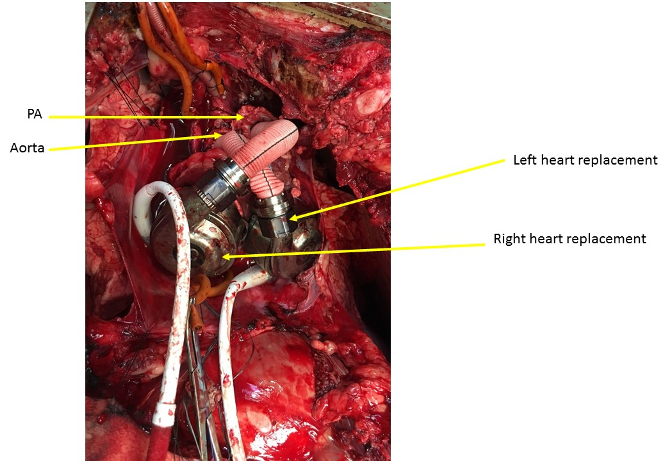 In conclusion, this manuscript describes the use of two centrifugal flow pumps as a total artificial heart for intracorporeal biventricular replacement in a cow model. This work was made possible through a research grant from Abbot Medical to Dr. Milano. We would like to thank Laura Janney and Abbot Medical for partial funding. We would also like to thank Duke Perfusion Services and the Large Animal Surgical Core for their assistance during the operations. Mozzafarian, D., et al. American Heart Association Statistics Committee and Stroke Statistics Subcommittee. Heart disease and stroke statistics—2016 update: a report from the American Heart Association. Circulation. 133, (4), e38-e360 (2016). Slaughter, M. S., et al. HeartMate II Investigators. Advanced heart failure treated with continuous-flow left ventricular assist device. N Engl J Med. 361, (23), 2241-2251 (2009). Fang, J. C. Rise of the Machines — Left Ventricular Assist Devices as Permanent Therapy for Advanced Heart Failure. N Engl J Med. 361, 2282-2285 (2009). Kirklin, J. K., et al. Seventh INTERMACS annual report: 15,000 patients and counting. J Heart Lung Transplant. 34, (12), 1495-1504 (2015). Leidenfrost, J., et al. Right ventricular assist device with membrane oxygenator support for right ventricular failure following implantable left ventricular assist device placement. Eur J Cardiothorac Surg. 49, (1), 73-77 (2016). Gerosa, G., Gallo, M., Bottio, T., Tarzia, V. Successful heart transplant after 1374 days living with a total artificial heart. Eur J Cardiothorac Surg. 49, (4), e88-e89 (2016). Pelletier, B., et al. System overview of the fully implantable destination therapy--ReinHeart-total artificial heart. Eur J Cardiothorac Surg. 47, (1), 80-86 (2015). Krabatsch, T., et al. Biventricular circulatory support with two miniaturized implantable assist devices. Circulation. 124, Suppl 11. S179-S186 (2011). Milano, C. A., Schroder, J., Daneshmand, M. Total Artificial Heart Replacement With 2 Centrifugal Blood Pumps. Oper Tech Thorac Cardiovasc Surg. 20, (3), 306-321 (2016). Strueber, M., et al. 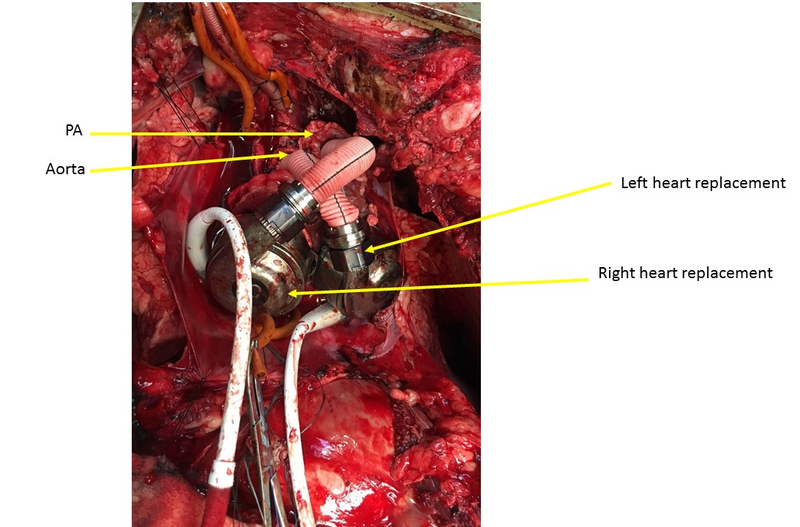 Placement of 2 implantable centrifugal pumps to serve as a total artificial heart after cardiectomy. J Thorac Cardiovasc Surg. 143, (2), 507-509 (2012).